There are two things in this world that I am good at: eating food and drinking beer. This blog post covers the latter because the previous updates have done a nice job of giving you a food tour. Chang: This was my favorite beer. It is light and drinkable. After a few 630ml bottles you are well on your way. Singha: Cara and Jeff liked this beer the best. This 5% pale lager is a bit dry but can be refreshing. Leo (sorry, no photo): This is the Bud Light/little sister (shout out to my U of M fans who know the feeling) of Singha. Though it is the cheaper option of the three beers, it is not the most desired. Beer will cost about 150 baht for a 3 pack of 630ml bottles at a convenience store (which is under $5 USD). However, at the bar it will cost 70-100 Baht for a beer. As always, drink in excess before going to the bar. 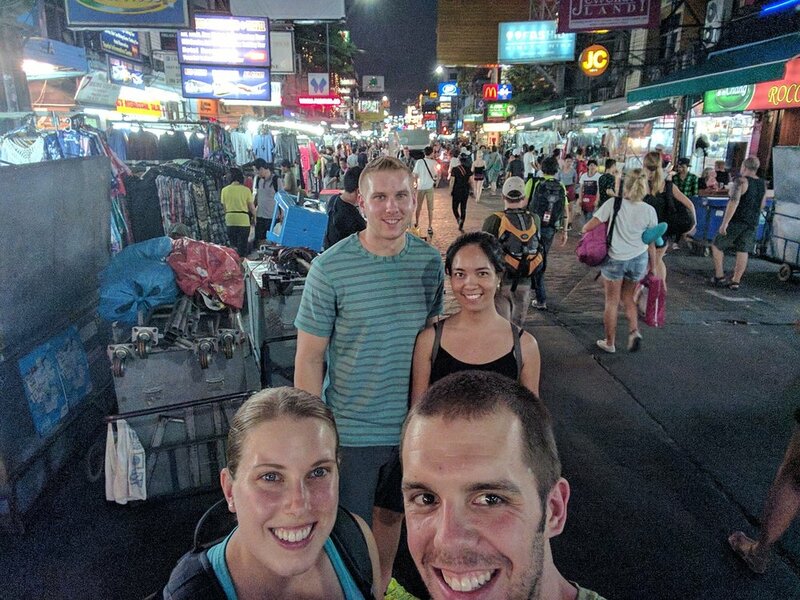 We ran into some issues purchasing beer as Thailand has abnormal hours in which you can purchase alcohol. But when we asked the cashier, he said if we went to a different store around the block they would sell to us (and did). So after a 15 minute walk I was happy with a beer in my hand. Apparently laws are as flexible as I have been told in Bangkok. I had been itching to go to Khaosan Road since I had read about it, so going there in the afternoon for one beer was a tease. Since it was a Saturday night and I knew it would be mayhem, Megan and I made sure to drink plenty of Chang before leaving. And let me tell you, this street does not disappoint. 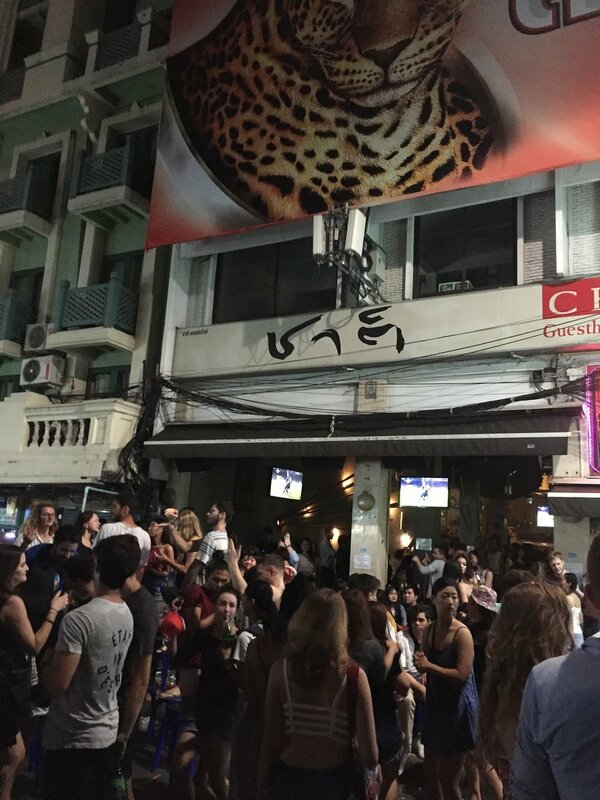 Khaosan Road is blocked by police for car traffic and lined with bars. Each establishment blasts music so as you walk 100 feet to the next bar, another club belter is on. To say the party spills into the street is an understatement. The party IS IN the street. Everyone is on the street dancing and partying to whichever track can be heard at that certain spot. The beauty of this road is that you can taste the vibes from every bar on the street as you walk through the throngs of people. Westerners were the majority, but there were Thais mixed into the crowd. Simply pick where you want to buy a drink and walk through the party aimlessly. You can buy just about any knick-knack you want on the street. Possibly the worst drunk purchase I have witnessed was Megan’s Pikachu balloon. Gone in 60 seconds describes its demise. 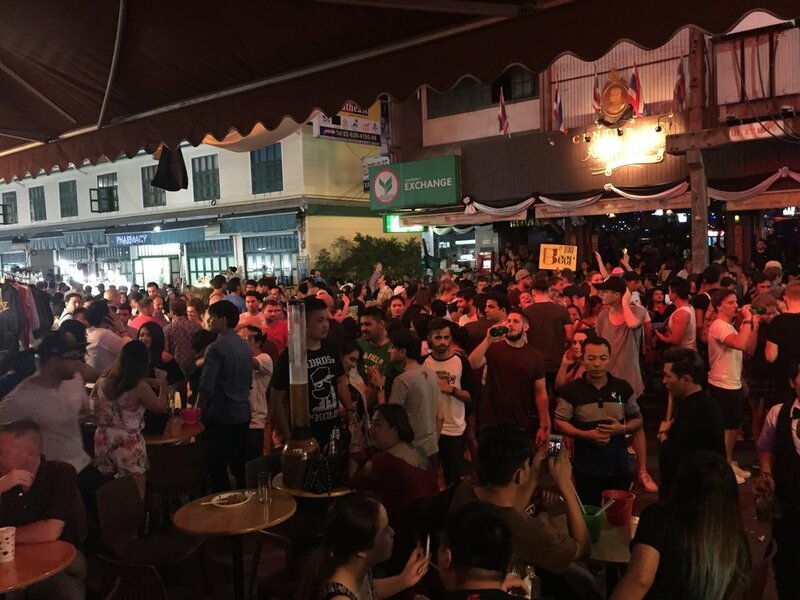 Once the bars began closing around 2:30am, the street began to clear out. 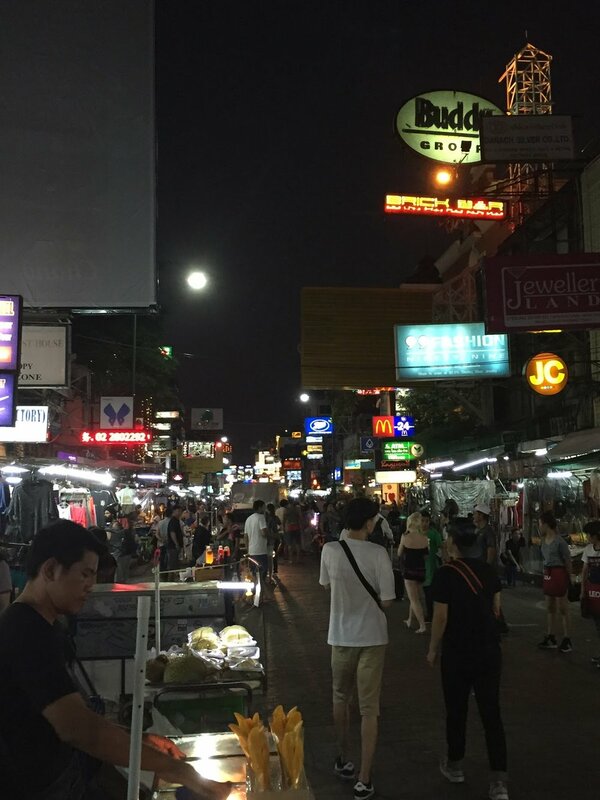 As we left Khaosan Road there were street vendors selling food. Since this is a good business model we happily donated to their cause. This was definitely the party that I wanted out of Bangkok. Yes it was a sweaty, sloppy, drunken affair but that was my expectation for the night. 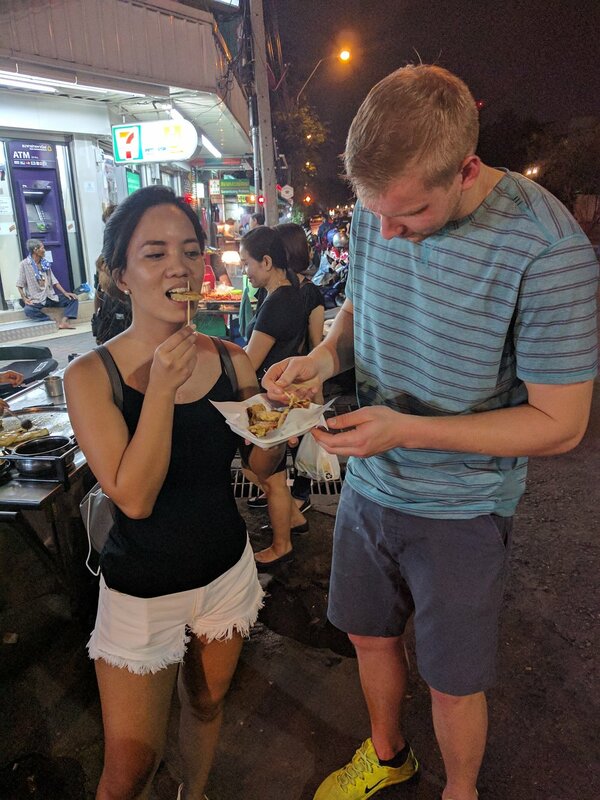 Drunk Thai street food = fulfilling. Phil currently lives in Chicago, where he works for the man by day, and lights up Wicker Park by night. He enjoys long walks along Lake Michigan, good food and beer in mass quantities. 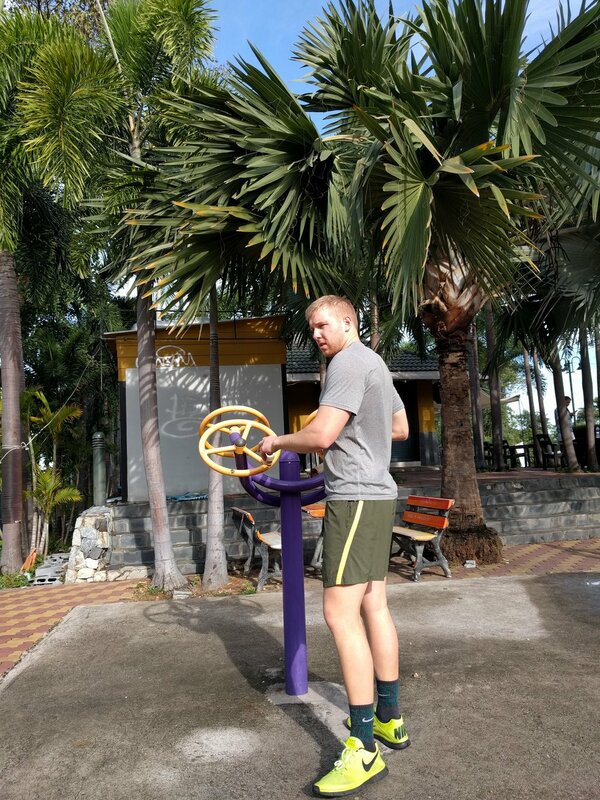 If he's not in the local bar watching Premiere League soccer, he's probably at the gym pumping iron (he did the best he could with the outdoor excersise parks in Thailand- pictured above).